Creating a brand new dynamic website, that looks and feels great, with easy user navigation and rich informative content. 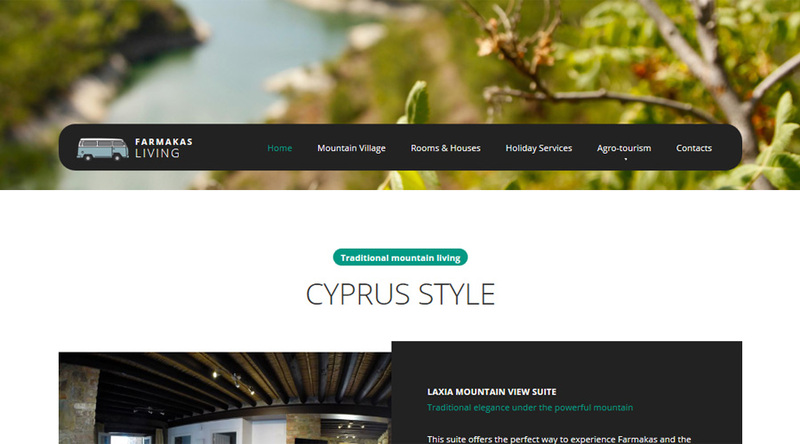 Overall, the goal in creating this website was to offer an excellent experience for the visitor, with interesting information about the village of Farmakas, as well as agro-tourism in Cyprus. In doing so, better presenting the village as an ideal location for a traditional mountain escape in Cyprus, as well as a great place to stay to experience agro-tourism, and the rest of the island. Farmakasliving.com represents Web-Conception's typical all-inclusive project, where after an initial brief and discussion with the client, our team took full creative control and directed the entire project until completion; reporting to client sporadically during the development phases. Ultimately, delivering a fully robust, content-rich and exciting website solution, that required very little time- and effort-spent on the client side, allowing them to focus on other aspects of launching this business. In addition, creation and management of the key social media channels, including Facebook, Google+ and TripAdvisor.